LONDON (AP) -- The Irish government published legislation Friday designed to ease the damage if Britain leaves the European Union next month without a Brexit divorce deal — but said it hoped the law would never be needed. The Irish government plans to fast-track the bill through Ireland's parliament before the U.K.'s scheduled departure from the bloc on March 29. As a major trading partner of Britain, and the only EU country that shares a land border with the U.K., Ireland faces a huge economic hit if a "no-deal" Brexit introduces tariffs, customs checks and other barriers between Britain and the EU. 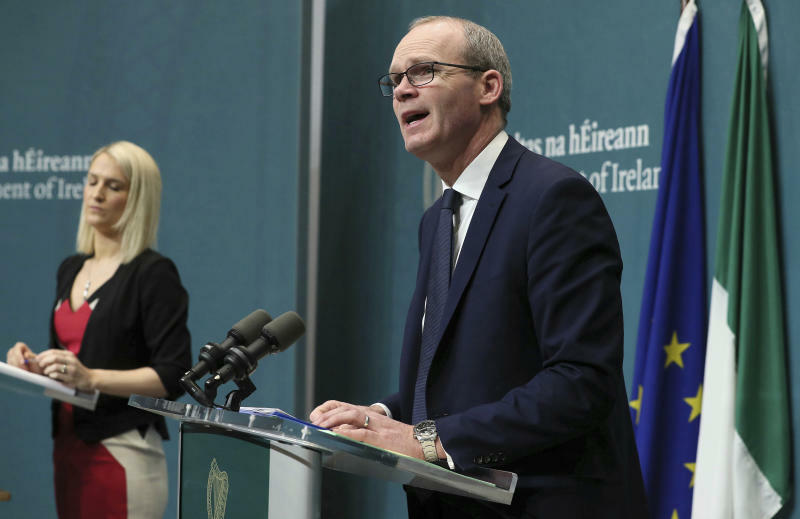 Irish Deputy Prime Minister Simon Coveney said the bill would try to "offset the worst effects of a disorderly Brexit." It seeks to support Irish businesses and ensure that citizens can still get health care and pension payments in the U.K. But Coveney said a no-deal Brexit would be "lose, lose, lose — for the U.K., for the EU and for Ireland." "I hope we never have to use the provisions set out in this piece of legislation. I hope we never have to commence this bill," he said. "Simply put, as a result of a lot of hard work my only desire is see this legislation sit on the shelf." British Prime Minister Theresa May and the EU struck a Brexit deal late last year laying out the terms of an orderly departure and establishing a long transition period so businesses can trade under existing rules while future trade relations are worked out. But Britain's Parliament rejected the deal last month and sent May back to the EU seeking changes. EU leaders insist that the legally Brexit binding withdrawal agreement, which took a year and a half to negotiate, can't be reopened. Still, the two sides are still holding talks, which the U.K. has called "constructive." May is due to meet European Council President Donald Tusk at an EU-Arab summit in Egypt on Sunday, although there is little prospect of a breakthrough. With Brexit just five weeks away, May is stuck between an intransigent EU and a resistant U.K. Parliament. Three lawmakers from her own Conservative Party quit the party this week over the government's handling of Brexit. May faces facing another showdown in Parliament next week with British lawmakers eager to wrest control of the Brexit process from the government and halt the slide to a chaotic "no-deal" exit. May must tell Parliament on Tuesday whether she is ready to re-submit her Brexit deal for approval. If not, legislators will get a chance Wednesday to try to change the government's course.